I'm a piano tutor with a passion for inspiring a love of music in my students. I genuinely believe anyone can learn to play an instrument, and it`s a gift that they'll get to keep and enjoy throughout their lives. Music is a powerful tool helping to build confidence, coordination and emotional maturity and I'd love to help you experience that! I teach from home because I have a purpose built studio with a beautiful Yamaha upright piano (YUS1 Disklavier). The piano itself acts as a teaching aid because it has built in electronics that will enable me to play back to the student what they`ve just played - often students are amazed to see the keys and pedals moving themselves, but they soon get used to it! My studio is also a fully fledged recording facility so I have the ability to record audio for lessons as well as video. Though this is a premium service, it can be useful to have a visual or audible record of the lesson. I've been teaching piano for the past 5 years working with students through the ABRSM syllabus. I've taken students from complete beginner up to grade 8, and build in music theory and aural training as part of the lessons. I come from a performance background being trained in classical piano with ABRSM, and ultimately made the decision to move away from a career path as a concert pianist into the mainstream music industry working as a session musician for many years. As a session player I've worked with various artists, my most notable major label work was with singer-songwriter Mika. My classical training has enabled me to also work as a composer for film/TV so I've been fortunate to have many pieces performed on major TV networks around the world. This has led to more recording and music production work from Opera and classical piano to rock and Indie music. Students working with me will benefit from a very rounded performance background, which means I build them up to be musicians rather than simply being technically proficient at something. This is coupled with a very inspiring environment to learn in. Because I have experienced both classical performance and contemporary music in the music industry my approach to teaching is focused on musicianship and training your ear. Having encountered (and employed!) session musicians that are technically proficient but unmusical, it's my desire to ensure my students have both. 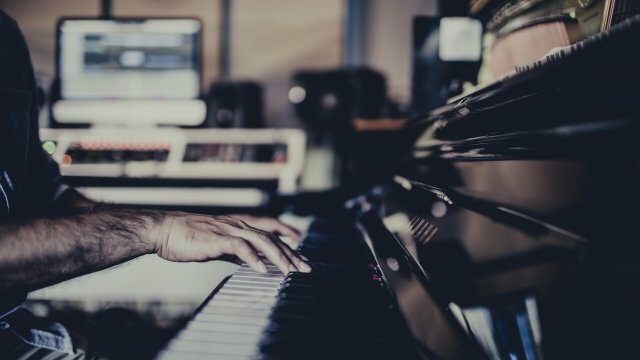 To me technique is important, but it's I think it's more important to be able to express depth and range of emotion, and musicality as those types of musician are more employable than those who can just play the notes accurately. I adapt my lessons according to the needs of the student so if it's purely classical piano music you wish to learn that's fine, but equally if you wish to learn Adele's latest song and learn how to play and improvise from chord charts that's fine too. My main aim to help you build the foundations for a life long love of music! AnimeshFrom Pauline (5/5): I have had three lessons with Animesh to date. I have enjoyed the lessons which are well structured and appropriate to my level. Animesh is a great teacher and I look forward to continuing my lessons with him.